weelife: Resolutions. Right On Track. Well, my New Year's resolution was pretty standard. We recently signed up for a family membership at the Y and we are taking full advantage. The little Bub is in swimming lessons and Hubs and I collectively have taken in yoga, spinning, water running, and Latin Funk. Yup! It's awesome. Spud had his own list this year. "I want to try 2 new sports and 1 new instrument, preferably a brass instrument, like the sousaphone." OK. First of all I want to say, what's wrong with something simple (and small!) like a recorder, my little friend? But we will tackle that later. In the meantime, 2 sports? 2 ticks. This is our view. We sit behind the glass, watch, sip coffee, get caught up with each other. We even brought some paperwork with us last time. And this is where we are sitting. Seriously. It's like we've been transported in both time and space. 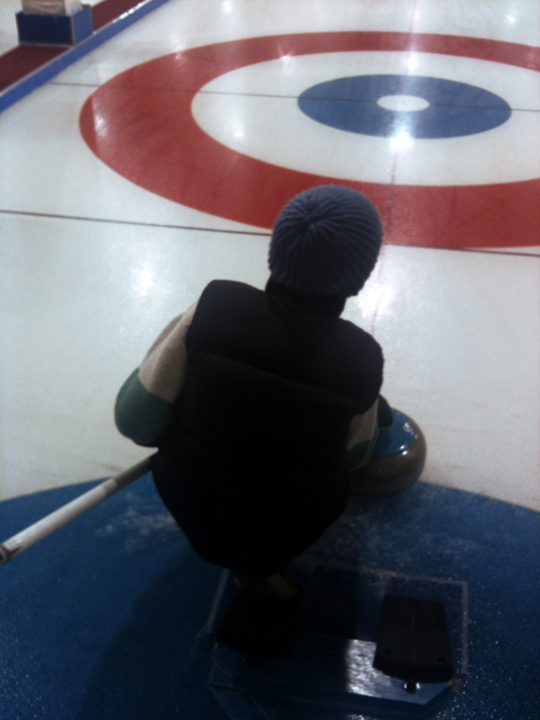 It's a beautiful 90 minutes I will miss dearly if Spud decides curling is not for him. Anyway, on to sport 2, skiing! So far we have a winner. Spud is happily going to curling each week but he is still a little unsure about it. Skiing on the other hand? An instant hit. He's had one lesson and one full day on the bunny hill with Daddio. 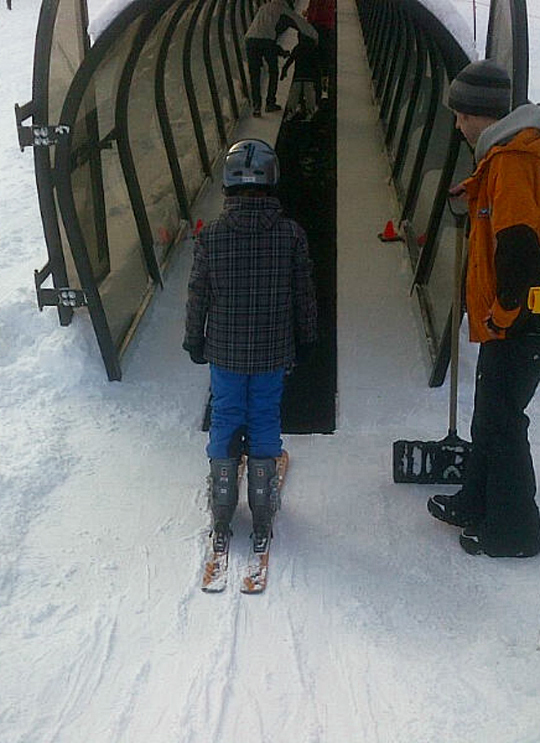 He has been heard to say "I think I was born to ski!" Now that's not to say he's careening down the hill on his own at any great speed or anything, he's a cautious kid, but he loves it. And that's what counts. I'm sure this crazy-awesome "magic carpet" that replaces the need for any dreadful rope tow, has got to add to the love.